Whenever you create a new event, we will automatically create a complimentary ticket type for you (don't worry, this can only be purchased through the Box Office and won't be an option for ordinary ticket buyers). 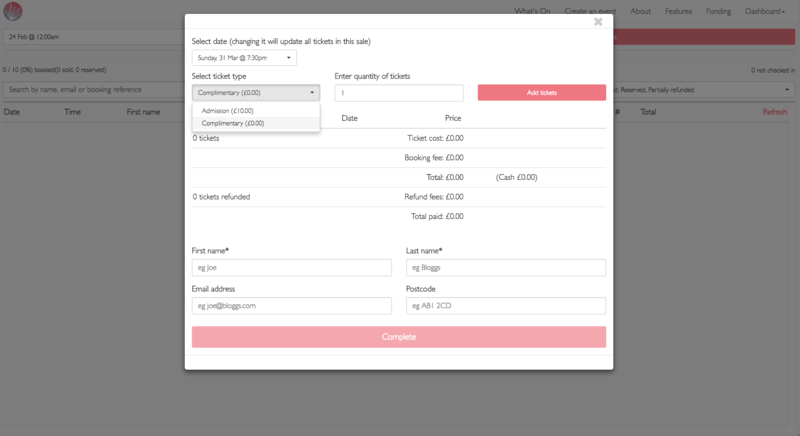 All you have to do to allocate a ticket, is head to your Box Office page, click the pink 'Book tickets' button, select the date and there will automagically be a ticket type called 'Complimentary' which you can choose. Type in how many tickets you'd like, click 'Add tickets', enter a name and then click 'Complete'. Simple.